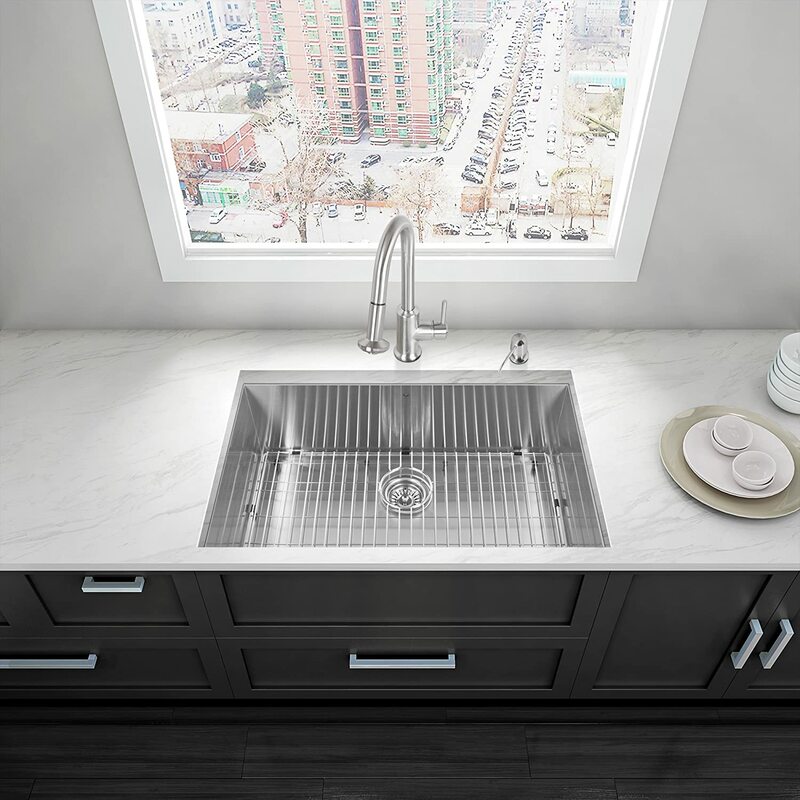 While there’s no shortage of stainless steel sinks on the market, your options quickly shrink when your budget is not even a quarter of a grand. But if you have found our site during your research, you’re in luck! This is because we have found and reviewed tens of highly affordable, budget sinks that offer pretty much everything you would expect in your ideal sink, but without breaking the bank. And the VIGO 32-inch undermount single bowl steel sink is one of the better options among them. So without further ado, let us tell you what does it bring to the table and why we think it can be a great buy. You Really Can’t Ask for More! 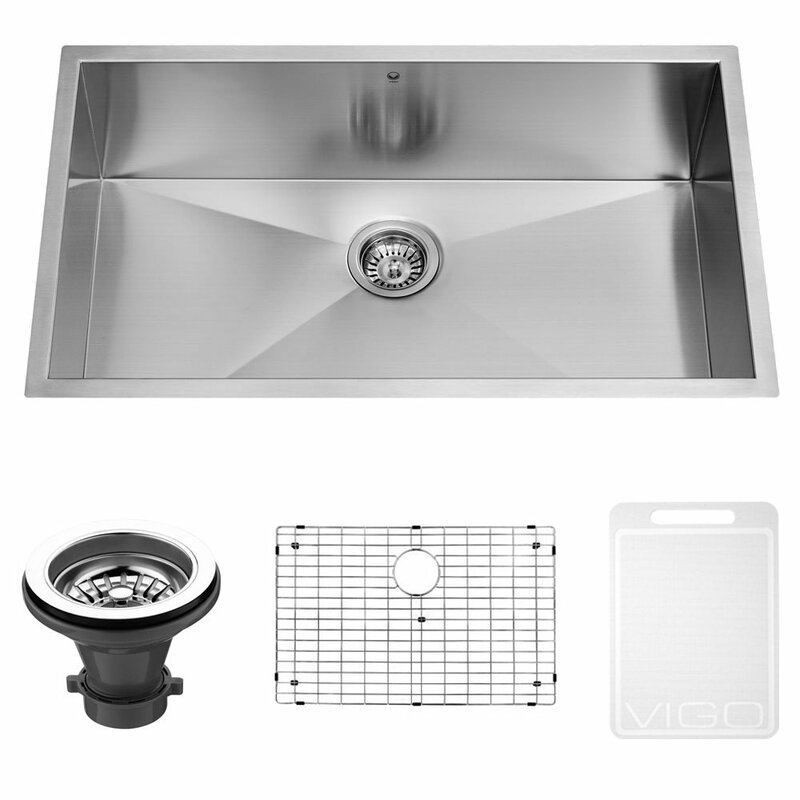 We usually never talk about price as the most important factor, but the VIGO 32-inch undermount sink is an exception. And that’s not just because it’s priced very low, but that it offers pretty much the same features as a sink that costs more than twice of what it does. It’s made using a 16 gauge steel and is coated with a premium satin finish that makes it look more attractive while ensuring a rust-free surface for a lifetime, and a lot more for an unbelievably low price tag. As we just mentioned above, this sink is made using premium 16 gauge stainless steel. However, it also boasts a premium quality construction, making it very sturdy and durable. Add to it the fact that the satin finish protects it against all kinds of rust, and you instantly have a sink that refuses to get damaged in any way even after years of regular use. If you expect a basic-looking sink at this price point, oh boy are you in for a surprise. The sink looks as premium as many other sinks that are way more expensive. While the design itself is very attractive, the premium satin finish adds even more to the overall look and would make it a focal point in your kitchen. 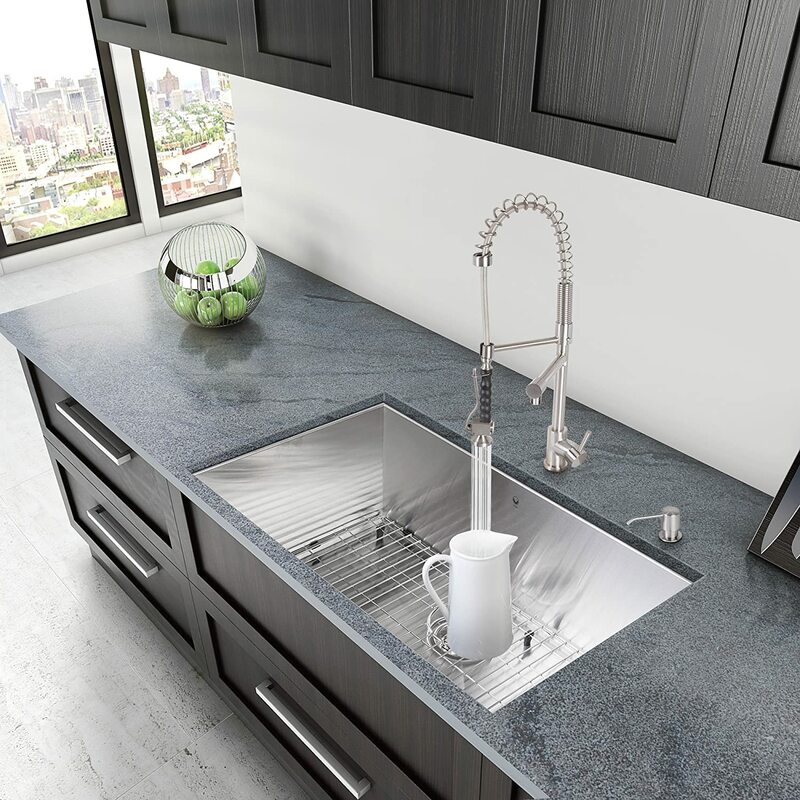 When it comes to metal sinks, one of the major issues is the constantly annoying noise they tend to produce when you’re using them. It can obviously make the usual washing much more challenging for you, especially if you have a lot of utensils to wash during every washing session. And while a large number of sinks come with some form of sound-deadening to prevent this to a certain extent, it gets less and less effective as you move towards a lower price range. This is where the VIGO 32-inch undermount steel sink turns out to be an absolute winner. It comes fully padded with multi-layer sound-deadening pads on its underside. This means that the sound-deadening it offers will be just as good as one of the much more expensive steel sinks on the market. It’s one of the few steel sinks in this price range that can offer a truly quiet washing experience. One downside to this sink – like pretty much most other stainless steel sinks out there – is that the drainage is not optimal. While the seller says that the elegant grooves add to the functionality and ensure quicker draining and drying, they actually don’t. There’s little doubt that the grooves look great, but they don’t dimple the sink enough to pave the way for effective drainage. You may find yourself using a ton of water just to get rid of the leftover stuff. 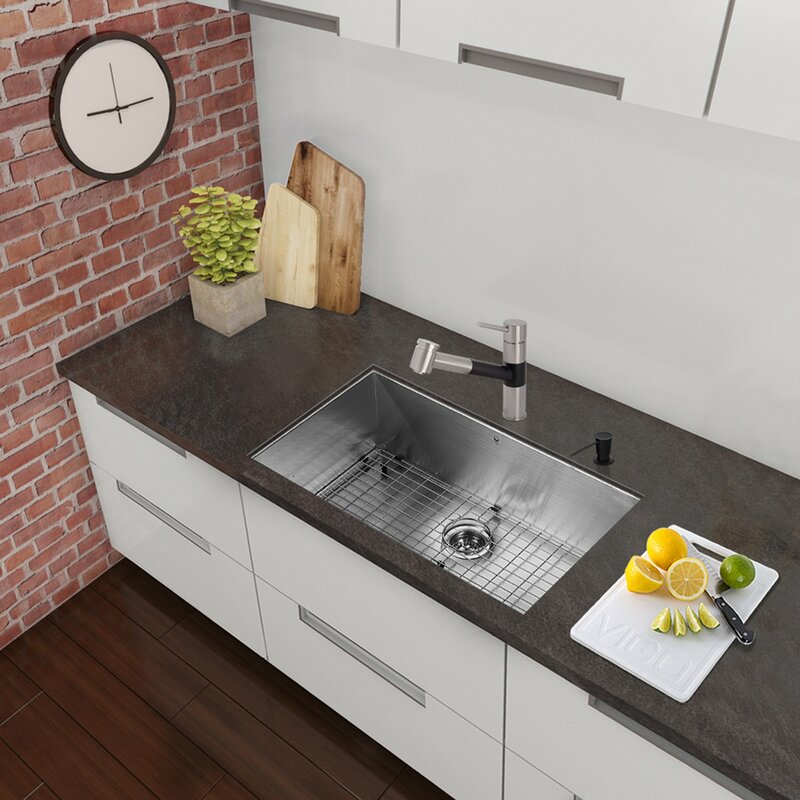 As a final word, we would say that you may not be able to find a stainless steel sink offering more in terms of features and a better quality than the VIGO 32-inch undermount single bowl sink at this price point. It’s not a perfect sink, but it’s probably as good as it gets in this price range.